Sammy Hagar won’t give up on his dream to reunite with Van Halen and who can blame him? For some of us, the “Van Hagar” years were the band’s best. Although I think Hagar was a better frontman than Roth, it’s is not my intent to dismiss the early years of VH as irrelevant. I still remember well the first time I heard Van Halen. I was sitting in a Leominster, Mass. nightclub called the Cinema Club in 1978 waiting for my favorite local band to come on stage when they played a few cuts from Van Halen’s first album over the PA system. “What the hell is that?” I recall thinking to myself. It was new, it was groundbreaking and wasn’t quite like anything I’d ever heard before, thanks mostly to Eddie Van Halen’s new take on what rock guitar should sound like. It was one of those moments that you never forget. Hagar appears to be harboring memories of his own that keep reminding him how great the band sounded when he was with them, and his recent public overtures make it pretty obvious that he’s still up for it. 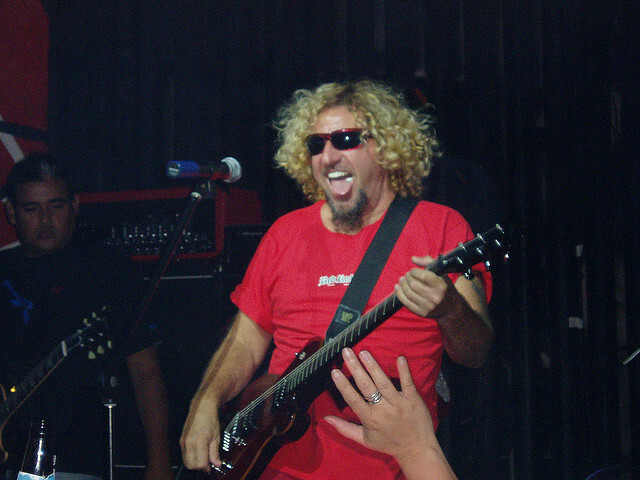 In a recent interview with Maxim, the Red Rocker is promoting the idea of embarking on a reunion tour that features both himself and original frontman David Lee Roth. There’s a long history of bad blood between the Van Halen brothers and Michael Anthony, and it might be safe to say that most of the hard feelings are still being harbored by the Van Halens. The majority of things I heard about Michael Anthony always indicate what a decent, go-along-to-get-along kind of guy he is, and according to a new book by Van Halen’s former road manager, Anthony was treated quite poorly by the other members of the band. That treatment reportedly included an especially sour deal where Anthony agreed to give up royalties he was owed for the 1984 album. Noel Monk, the book’s author and former Van Halen manager never understood why Anthony agreed to the deal. Perhaps Anthony is just too nice a guy. A lot of fans, including myself, would be excited to see a Van Halen reunion that included both Hagar and Roth, but one has to wonder of there is any realistic chance that Eddie’s son Wolfgang, would step aside and allow Michael Anthony to resume in his original slot. Wolfgang has reportedly been doing a pretty decent job since he joined the group but for many fans, that particular line-up just ain’t Van Halen. Roth’s latest outing with the group pretty much proved that he hasn’t really got the vocal ability to hold things anywhere near like he did in his younger days, but from what I’ve seen recently, Sammy Hagar is still hitting the high notes like a pro at the age of 69. This would be about the best thing these guys could possibly do and they really shouldn’t waste any time because at this point, they’re all eligible to collect Social Security. I , for one, would not doubt that even a little bit.